The Starbucks red holiday cup is back! This time, with a twist! However, if you’re a die-hard Starbucks seasonal cup enthusiast, this new red cup isn’t that strange at all. Unlike years past where the annual red holiday cup is covered in trees, twinkle lights, and snowmen — the cups have become more minimal and inclusive over the years, moving away from strictly Christmas-centric images and towards ones that embrace whatever holiday you celebrate this time of year. The new cup features a white heart surrounded by stencil hands clasping into a heart shape, leaving you to embellish the cup to your liking. Add some doodles or fill in the center of the heart with the name of the person you hold close to your heart. Gwen Stefani was an early adopter of the red cup and filled her open heart with her boyfriend’s name, Blake Shelton. Awww. Starbucks actually did this with the spring and fall cups which featured giant white circles that you could illustrate yourself. We love how minimal the new cups are. They remind us of the 2015 red cup which was simply red all over with the Starbucks logo. 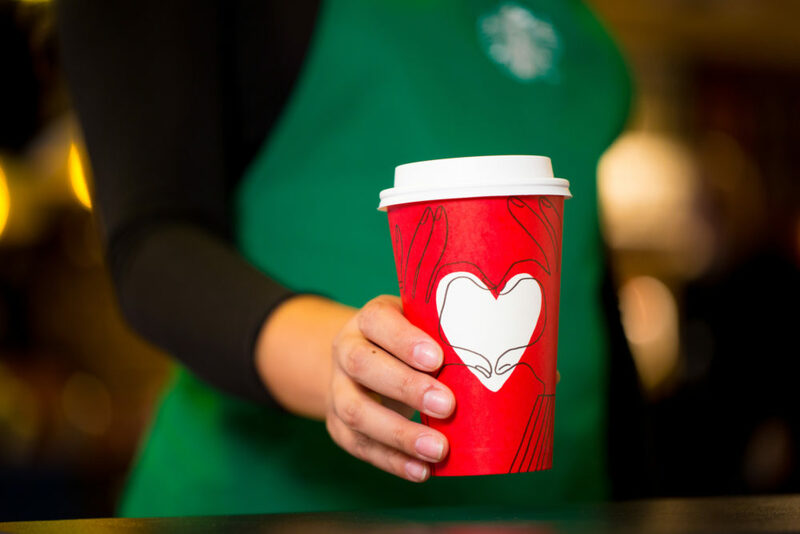 The red cups are available starting today (November, 28), and Starbucks encourages coffee lovers to write their loved one’s names on the cup and share their java snaps on social media using the hashtag #GiveGood. Some people have gotten seriously creative with their cups. This new red cup pairs well with the current holiday cup, which features illustrations by the same artist.